I first met a jetlagged Alabaster DePlume wandering around the Total Refreshment Centre one summer afternoon. Now it must be noted that you meet a lot of people at TRC but as soon as he greeted me with the delectable question “what’s it like being you?” I knew he was an artist and a good one at that. And artist is what he is: musician, poet, performer, provocateur and troubadour – DePlume effortlessly manages to embody all of these things in his daily encounters with people, as well as on the stage. Never have I known an individual so sincerely intrigued by people other than himself. So it gives me the greatest pleasure to be celebrating his work with the exclusive premiere of ‘Be Nice to People’, taken from forthcoming record The Corner of a Sphere. Alabaster’s inimitable Manc delivery is as comforting as it is thought-provoking, while the ethereal wall of sound that accompanies his voice is layered with soothing choral vocals and delicate guitar. Yet it is once again Alabaster’s distinct vibrato saxophone that floats across the track with such calm intensity, with plenty of delay courtesy of Danalogue on production duties. For those of you that don’t know Alabaster DePlume, get to know. And if you really want to get to know him head down to his notorious Peach nights where you can see him perform with an array of spontaneously curated and incredible musicians. Past incarnations have featured Theremin players, a gamelan orchestra and This Heat's Charles Hayward. You can hear more about Peach and his approach to music and life in this interview we did with him last year. Alabaster DePlume's 'Be Nice To People' is taken from his forthcoming album The Corner of a Sphere, which will be out via Lost Map Records in early 2018. 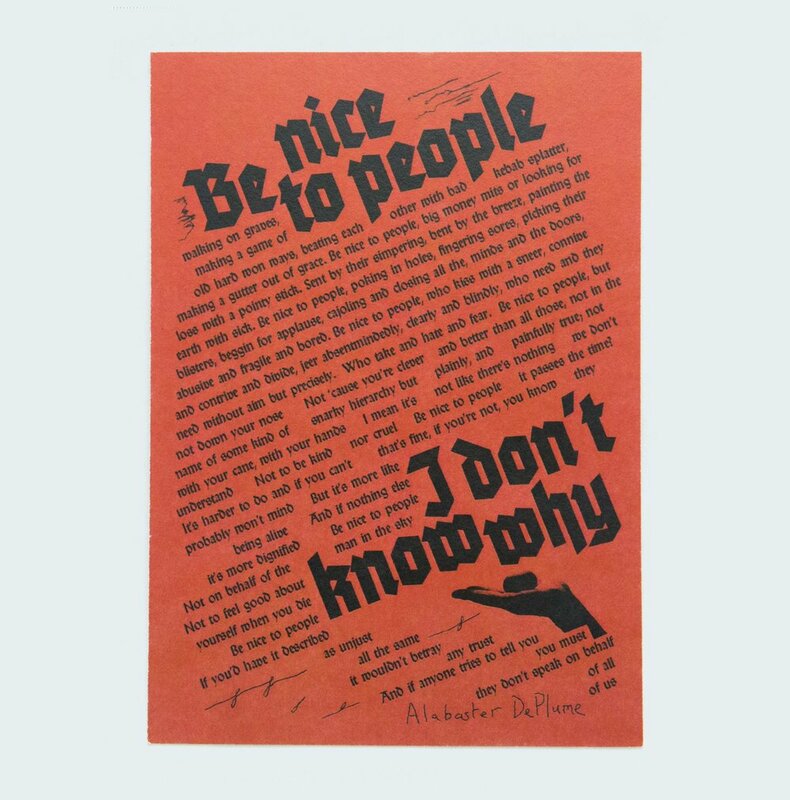 Pick up your copy of the 'Be Nice To People' Lost Map postcard here. Alabaster DePlume's Peach returns to TRC on Thursday 19 October. More info here.